It’s been two months since Doomsday Clock had an issue release, but boy has the wait been worth it! 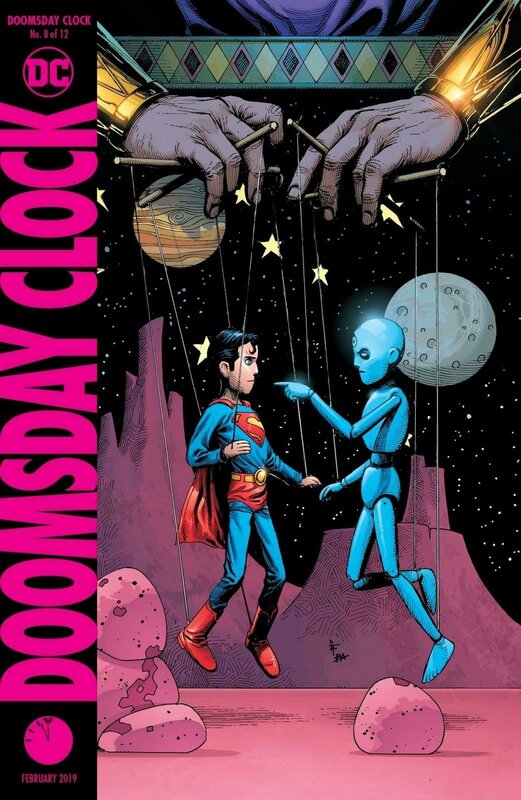 Today Doomsday Clock #8 released and the next chapter of Geoff Johns and Gary Frank’s magnum opus is a politically tense issue, which aims to reflect our own world and the state of it. So let’s begin. 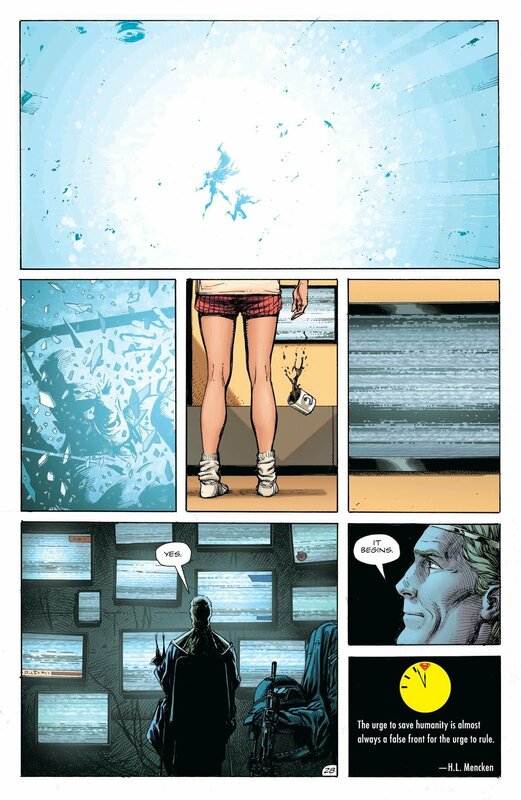 The issue opens up with Ozymandias, having broken into the White House looking for information. That info isn’t revealed, but Ozy has found what he was looking for. We then switch over to Clark and Lois, coming into work and finding that Lois’ desk was broken into. Not seeing any signs of forced entry or fingerprints, Clark is cut short when he’s told by his boss, Perry White, that he needs to get back on his story about the Supermen Theory and if it holds water. Lois finds that someone has left a envelope in her desk, with a USB. Suddenly the TV interrupts the newsroom as a protest in Russia is interrupted by Firestorm. The protests are against new Russian laws that force newborns to be tested for the metagene and be taken into custody. Firestorm then begins to fight the “People’s Heroes”, Russia’s metahuman team. Knowing it can’t go well, Clark changes his clothes and flies off. During the battle, Firestorm is hit badly and he falls into the crowd of civilians, who immediately begin to attack him. In a moment of fear and rage, his powers flare up and he accidentally turns the angry mob into glass. Horrified, Firestorm flies off, leaving the world watching in terror. Superman lands in Kahndaq, assuming that Firestorm fled here as many metahumans have already, including Giganta, who was present at the massacre of supervillians caused by The Comedian. 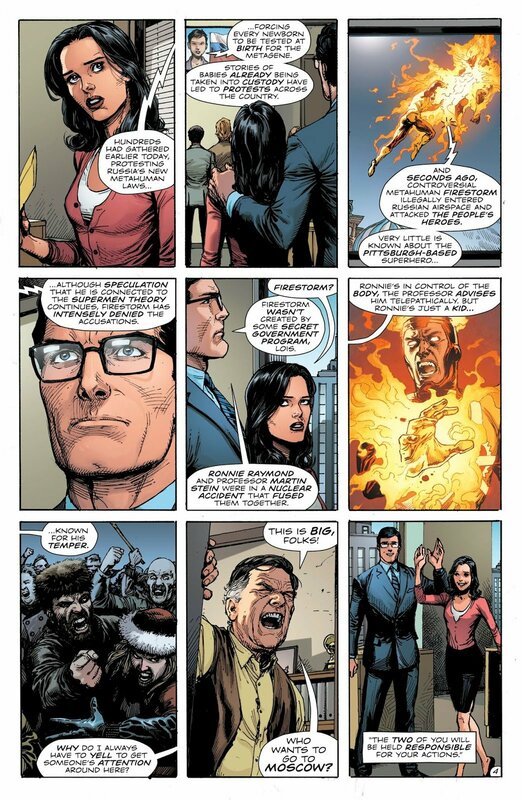 Superman and Black Adam discuss the tension building in the world, with Adam stating that his country is now the only safe place for Metahumans. 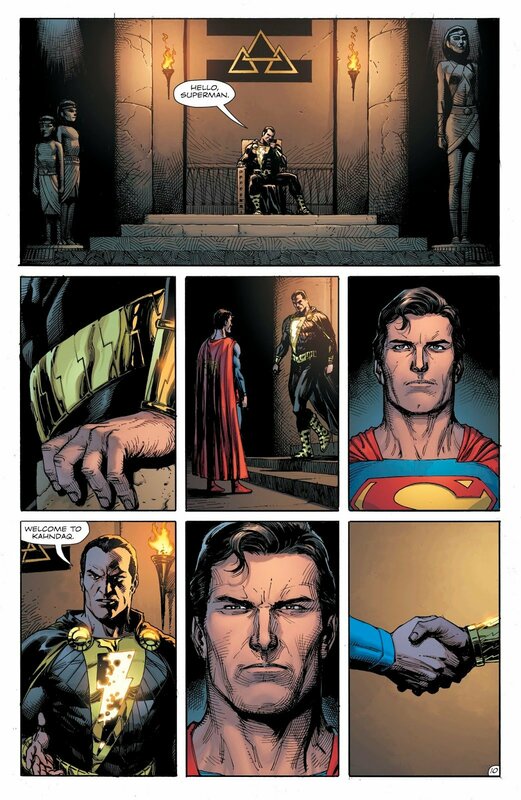 Superman argues that Kahndaq is drawing slot of attentions since Black Adam broke treaty laws by invading and attacking Syrian troops. Adam knows this, only cause he knows that war spilling over into his borders will only lead to a full out conflict in the region, and no one dare attack the nation offering sanctuary to any and all metahumans. 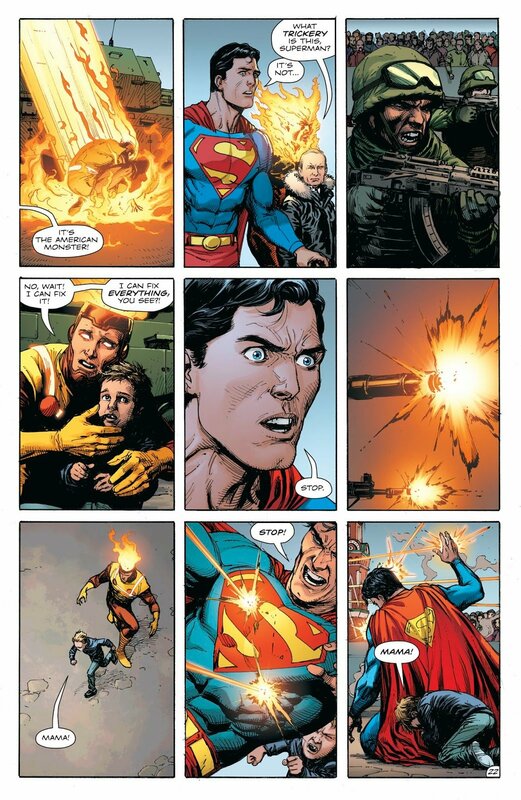 Superman warns for Adam to ease it up or he’ll be dealt with, and takes off to Russia to find Firestorm. He finds him hiding in an old nuclear powerplant, trying to restore one of the glassed bystanders, a child, back to normal. Superman offers advice, and believes that Firestorm can do right. He tries again and by sheer will, manages to restore the child back to normal. During this, Lois watches a video on the USB and sees an old World War 2 reel showing the Justice Society of America, the original superhero team. But since they don’t exist in continuity, Lois doesn’t understand the clip. In Russia, Putin address the nation, stating Russia has no thoughts about letting tensions cool down, that the American Government has purposely been building an army of Metahumans, skirting the treaty of denuclearization. As such, Russia must do the same and declares they are now at war. He’s interrupted when Superman flies down and asks to speak to the Russian people and the world. Putin agrees, remarking on the fact that Superman is the only trustworthy superhero in the world. Meanwhile, Batman is en route to Russia, with the goal of preventing any more problems from developing between the US and Russia. Superman comments that the divide that has been growing between nations must end, as it’ll only lead to their destruction just as Krypton could’ve be saved due to lack of diplomacy and action. 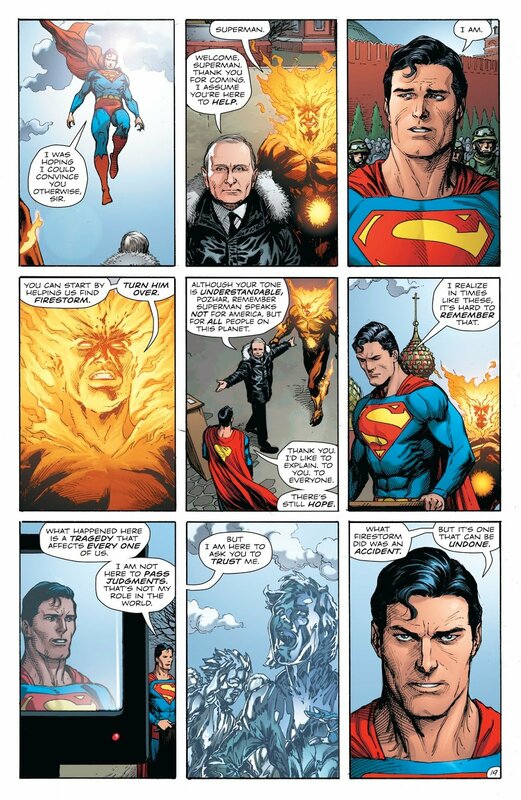 But Putin, now angry and claiming Superman is trying to cover for his American teammate, is saying he has proof that Firestorm, and many others, are working for the US government. Firestorm then arrives on the scene. And then a sudden burst of blue explodes, destroying everything in the nearby radius. Batman’s plane, caught in the blast, windows shatters while Lois drops her coffee ans watches the TV static in horror. The only one who seems to know what’s going on is Ozymandias, who watches through multiple screens and says one thing…. Doomsday Clock #8 continues the sped up pacing from #7, pushing the story faster and faster towards it’s climatic finale. The art, as always with the series and Gary Frank, is beautiful and outstanding! 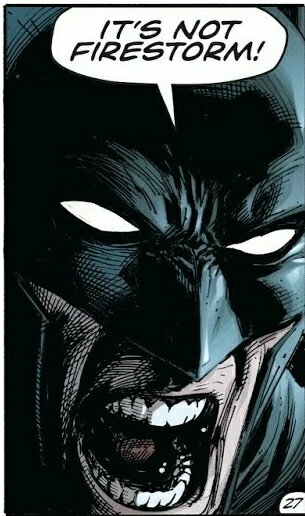 The duo of Geoff Johns and Gary Frank has proven to be a powerful team up, as seen from their previous work. 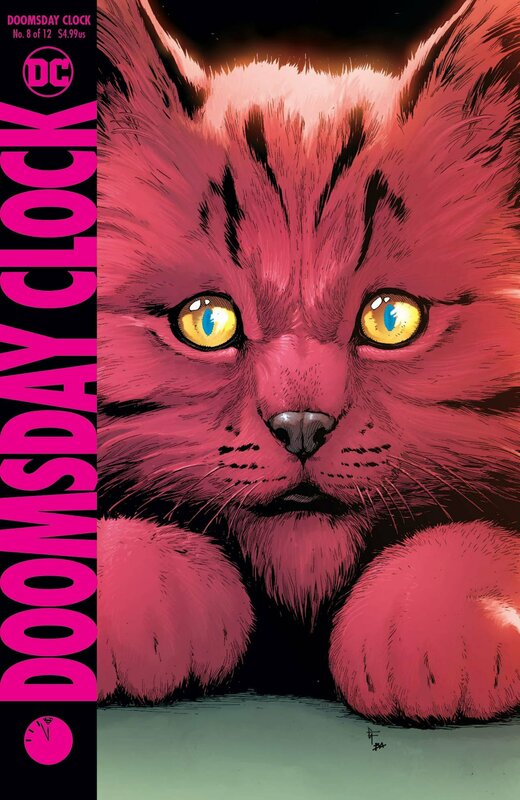 Doomsday Clock is surely to be their magnum opus and it’s sure to end as much as it started: violently. 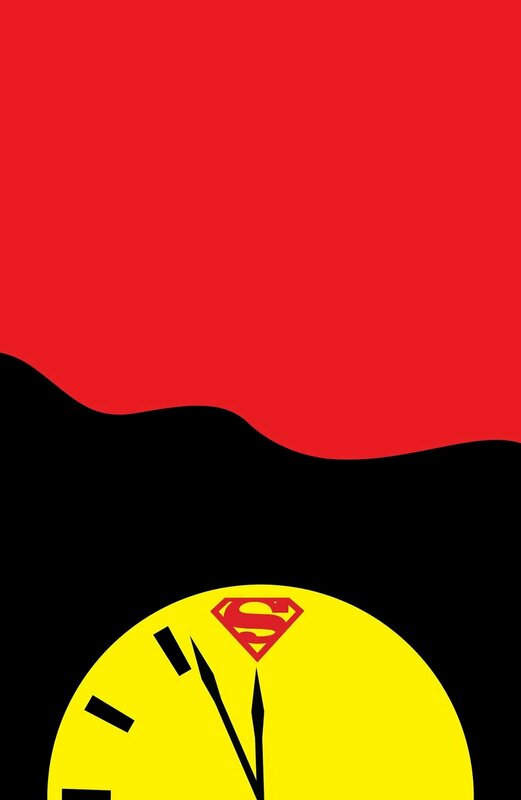 I give Doomsday Clock #8 10/10 for pushing the story forward, jam-packed with material and content that it’s surely to make up for the delay.